Oskar Blues is one of the few craft breweries that needs no introduction. If you haven’t had Dale’s Pale Ale by now, then welcome to planet earth. I hope you come in peace. Dale’s is the definition of ubiquitous. It’s probably in your fridge right now. 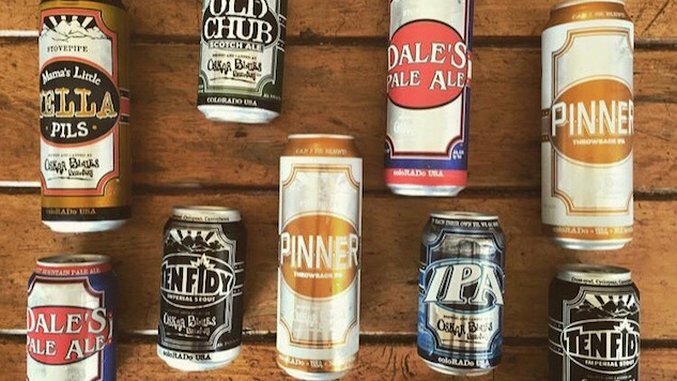 And just when you thought Dale’s couldn’t get any more prevalent, Oskar Blues recently announced they’ll begin distributing to two more states, Mississippi and Utah. That brings Oskar Blues’ total distribution footprint up to 46 states. And OB isn’t stopping there; they’ve pointed to the fences and claimed they’ll conquer those remaining four states by the middle of 2016. Oh, and they’re also building another production brewery in Austin, set to open in April. In other words, Oskar Blues is taking over the world, so we thought it would be a good time to pick our five favorite OB beers. This double IPA used to be available year-round, but Oskar Blues scaled it back because of limited quantities of Centennial hops and is only releasing it as a seasonal winter brew. Those Centennial hops steal the show in this super citrusy, grapefruit IPA that has a beefy 8% ABV. Imagine if Dale’s Pale Ale, the mild-mannered “everyday beer” we all know and love, took a cycle of steroids. Look for it in 12 ounce cans right about now. Okay, the regular Ten FIDY is amazing, but this rare bourbon barrel-aged version is straight up amaze-balls! Oskar Blues took their killer imperial stout and aged it for five months in Maker’s Mark Barrels. It’s a beer they’ve had on tap off and on at their brewpubs, but Oskar Blues released about a dozen of these in 19.2 ounce cans back in October. Alright, they released more than a dozen, but you get the point. It’s tough to find, but totally worth the hunt. Is it weird that I don’t love Scotch ales? I don’t. Maybe they’re too sweet, maybe they just fill a beer niche that I personally don’t need filled. But I’ll be damned if Old Chub Nitro didn’t win me over. The nitrogen treatment rounds all the sharp edges and gives the chocolate, smoky notes of the Scotch ale an incredible depth. OB released it in tallboy cans, and dropped the ABV from 8% to 6.9% to make room for that nitro widget, but I don’t miss the extra booze. Unfortunately, the cans have now gone the way of the dodo, but the beer is still available in kegs, and the cans are expected to return after the first quarter of 2016. Oskar Blues released two new, incredible IPAs last year, Pinner, a low ABV session IPA and IPA, which they call a “metamodern IPA.” I love them both, but if I have to pick just one, it’s gotta be IPA. It is everything you’d expect from a modern IPA—juicy, fresh, dank, full of fruit, plenty malty, not that bitter and incredibly satisfying. And it’s year-round, in a can meaning you can have a killer IPA just about anytime, anywhere. Oskar Blues takes an incredibly roasty, malty porter with notes of cocoa and caramel and infuses cold-extracted coffee from Colorado’s Hotbox Roasters to impart notes of plum, more chocolate and even a bit of blueberry. Oh, and coffee. You definitely pick up some coffee in this porter. Oskar Blues released the beer in 12-ounce cans nationally, but only for a limited time. It’s available through January, so seek it out while you can.